What is COPD and why is support important? Chronic Obstructive Pulmonary Disease (COPD) is a common, preventable and treatable disease and symptoms can include breathlessness, coughing and tiredness. People with COPD tend to be older and often experience multiple physical and psychological conditions, such as cardiovascular disease, loss of muscle, anxiety and depression. Many people with COPD have reduced mobility and it is common for them to be living alone. Incidentally, many report a reduction in their quality of life and due to worsening of their symptoms, they can be highly dependent on the healthcare system for further support. There are an estimated 328 million people living with diagnosed COPD worldwide and this condition is therefore a huge challenge for healthcare systems globally. Evidence from recent systematic reviews on the facilitators and barriers to self-management and physical activity suggest that social support is an important factor in the maintenance of healthy behaviours. However, as many people with COPD live by themselves and have reduced mobility, an important question is how to best help patients live with their condition and have access to social support. Is social media an answer? The term ‘social media’ is defined as computer mediated technologies that facilitate the creating and sharing of information, ideas, career interests and other forms of expression via virtual communities and networks. Examples of such technologies include popular applications such as WhatsApp, Facebook and Snapchat. 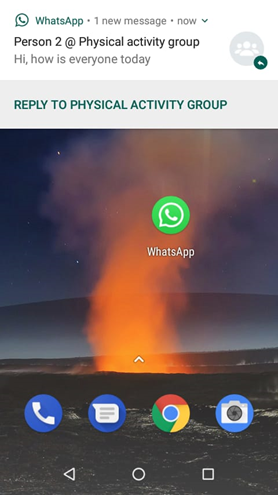 These applications make it possible for people to connect with others in similar situations. There is a rapid development of technology and an increase in the use of social media in healthcare, however, the suitability of social media for specific population groups is a debated topic, with arguments for and against its use. Social media provides a platform to quickly share information to a large, targeted audience. Individuals can send and receive instant messages for free. Social media can connect patients together via instant messaging platforms, empower patients to self-manage their condition and motivate patients to maintain healthy behaviours. In addition, social media also enables healthcare professionals to contact far reaching patients and otherwise isolated individuals and monitor their health status. All these factors may increase individuals’ physical and psychological wellbeing, thus potentially saving time, money and general frustration for both the patients and NHS! 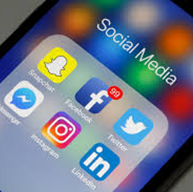 However, it could be argued that social media is not suitable platform for a large proportion of the COPD population, as individuals tend to be older and more socially disadvantaged and have less experience using the internet. In 2013, data from the UK Office for National Statistics show that whilst 90% of 16–24 year olds have used social media, this was true for only 19% of 65–74 year olds. However, recent data also shows that households with individuals 65+ also had the largest growth of internet use since 2012. Research in Latin America by Ojeda and colleagues in 2016 explored the use and preference of social media in individuals with COPD. Of 88 people who took part, approximately 40% used Facebook, and approximately 30% reported using the internet for getting information about COPD, suggesting that social media could be a way forward in this population. Data suggests that internet use is rising in this population and therefore it is likely that social media is becoming more suitable as time goes by. It is also important to consider that limited social media and internet access does not suggest that individuals would not benefit from, or be engaged, with social media in the future, only representing a barrier that could easily be overcome through education and training. Interestingly, 74% of patients in the research by Ojeda and colleagues reported interest in using WhatsApp to communicate with doctors. The results from recent research exploring the acceptability and usage of the internet in COPD healthcare suggest that internet use, including engagement in social forums and online communities is a feasible approach to healthcare treatment in this population. These results provide food for thought on using social media, and hence, digital technologies in COPD healthcare. However, there is limited research on the use of social media as an effective strategy to improve healthcare for individuals with COPD. An ongoing feasibility study in Lincolnshire is addressing the concerns surrounding social media by incorporating social media (WhatsApp) in an intervention to promote physical activity following pulmonary rehabilitation for individuals with COPD (NCT03660644). Pulmonary rehabilitation often improves patients’ symptoms and fitness levels, however, individuals can struggle to maintain physical activity over time. Individuals often report enjoying the social nature of pulmonary rehabilitation, due to the interactions with peers and health care professionals, and one of the barriers to maintaining physical activity is the lack social support after the programme. To maintain peer support, individuals who have completed pulmonary rehabilitation are being added to WhatsApp groups to connect them with fellow pulmonary rehabilitation graduates. At point of writing, the study has been running for 7 months and there are mixed feelings from many participants. Some individuals reported that they were unfamiliar with smartphones or with WhatsApp and were therefore apprehensive about mastering a new device and application. However, many of these individuals also liked the idea of a new challenge and are currently engaging in WhatsApp. A member of Lincoln Breathe Easy (a COPD support group) is currently involved in the feasibility study which has connected members of pulmonary rehabilitation together in a WhatsApp group. They have an active role in facilitating the WhatsApp group by sending regular messages to encourage people to stay active following pulmonary rehabilitation. They believe Social Media is a great way to keep people connected, especially if individuals already know each other and regularly meet. For those unfamiliar with Social Media, a priority is to provide simple tuition to support people to feel confident with using applications like WhatsApp which support instant messaging. One way to do this is to provide peer support during Breathe Easy meetings or during pulmonary rehabilitation. They are looking forward to being actively involved in further research with the University of Lincoln and hope to help improve support for people with respiratory conditions. COPD is a common respiratory disease and represents a global challenge in healthcare. Social media enables individuals to share information and receive social support, removing barriers such as transport and cost. However, limited motivation to use social media and limited understanding of technology and online social applications may dampen individuals’ perception and experiences of Social Media. Current research is exploring the effectiveness and acceptability of delivering social support via social media and preliminary findings suggest there are mixed views on the benefits of social media. However, if social media has a place in healthcare, the next step could be understanding how healthcare professionals could provide sufficient support for individuals to become confident in effectively navigating the internet and using social media. In addition, research to explore the popularity and preference of different devices, for example, phones, tablets and computers could facilitate using healthcare services via the internet. More research is necessary to understand individuals’ perception of social media and, how and where it can have a place in healthcare.